There are a set of pages describing each of the sub-systems in the van, how it came, what we have changed, and why. The links to these sections are in the index to the upper left of each page. Largely this is a compilation of what we wish we had known when we started out on this venture, what we have liked, and what we have disliked. Also, hopefully, it can serve as a guide to others who wish to do modifications on their van similar to those we have undertaken. 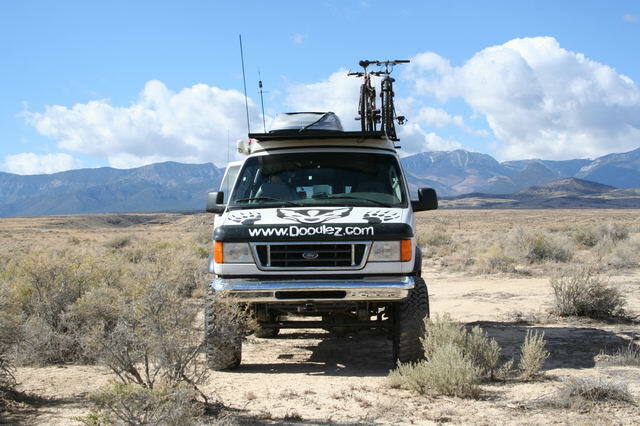 We don't know if others will or won't have the same issues we did, this is based soley off the experience we have had with our own van, with our own custom floor-plan, and with our own lifestyle and personal quirks. We cannot say what Sportsmobile or any other vendor will or won't do, whether issues we have found are addressed on other vans, or when the planets will properly align to help out your love life. We are happy to answer questions that are not addressed in here, but it may take a while for a response and there is no guarantee that our answers are in any way relevant or useful. 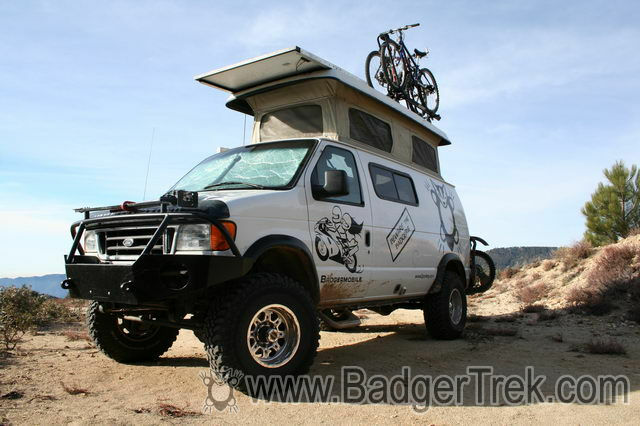 Our Home/Vehicle for the moment is a 4x4 conversion van built by Sportsmobile based on a 2005 Diesel Ford E350. We have done some fairly extensive re-work to the systems in the van described on the various sub-pages. 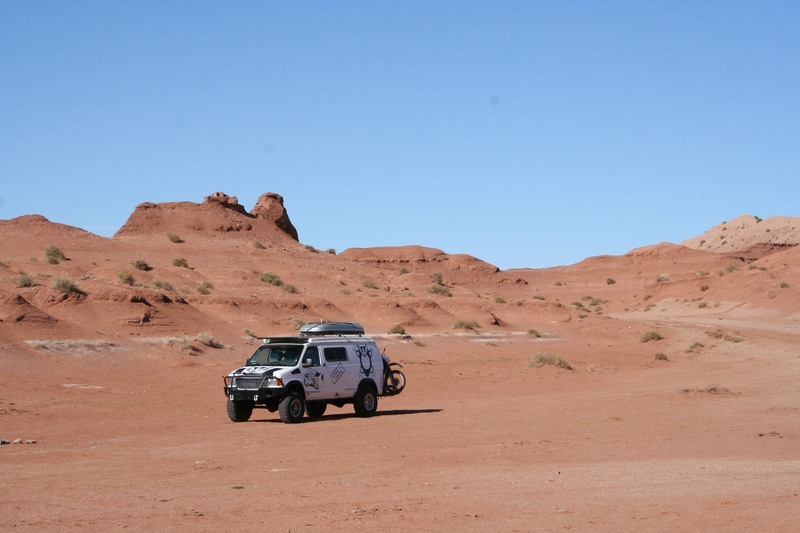 We intend to be living in it for a couple of years, or more, and to be traveling to remote places, so we had some basic requirements that ended up requiring us to get a new, custom-built vehicle. Our journey begain in June of 2005. We first saw a Sportsmobile (Summer 2002) when kite-boarding in Hood River, OR. There was a bright yellow one on display at a kite-swap in town. We were impressed with the concept, and began to consider getting something like it for our travels at some point in the future. The prior year we had spent a month traveling through the mountain states living in our Toyota Tercel (a 2 door compact car), but it was a bit cramped, even for small people (foam-rubber bed spanned the trunk & back seat, paragliders in the roof-rack, bicycles on top too, camp-stove & jugs of water for cooking, etc). While kiteboarding we were doing the same setup except with the boards and kites up top in place of the gliders. Getting in and out of a zipperless wetsuit inside a small car filled with camping gear in mid-summer is not a pleasant experience. 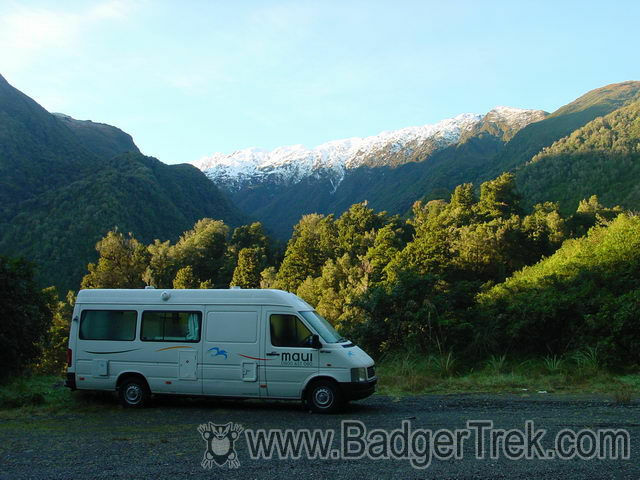 In the spring of 2004 we traveled to New Zealand for a month, rented a camper-van, and explored the country. We viewed it as a test of life in a confined space, an exercise in seeing what we needed to bring, and a source of ideas for an internal layout in a conversion van that would work for us: if we could do it in a foreign country, driving on the wrong side of the road, we could certainly do it in the states. The van we rented ended up not being available and they up-graded us for free to the next larger size without mentioning it (we figured this out the first evening when comparing our van to the rental literature we had used to setup the reservations). The result was an EB Sprinter van (Daimler chassis with the VW TD engine), and much too large for comfort in a country with small narrow roads and parking spots. The interior layout was not very space-efficient, and there was no heater when not-plugged in. We learned a lot in that month and applied it when we begain to lay out what we would want in a Sportsmobile or similar. 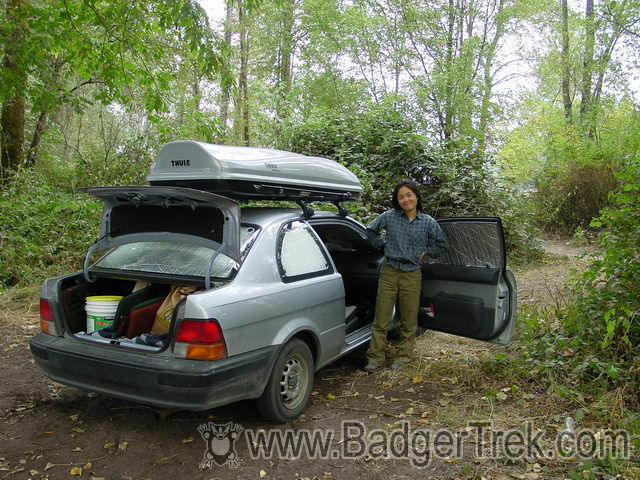 In January of 2005, after a lot of watching ads for used Sportsmobiles that were similar to our desires, we found one advertised locally (while warming up in a Starbucks after the one and only day of Snowboarding the winter allowed us). 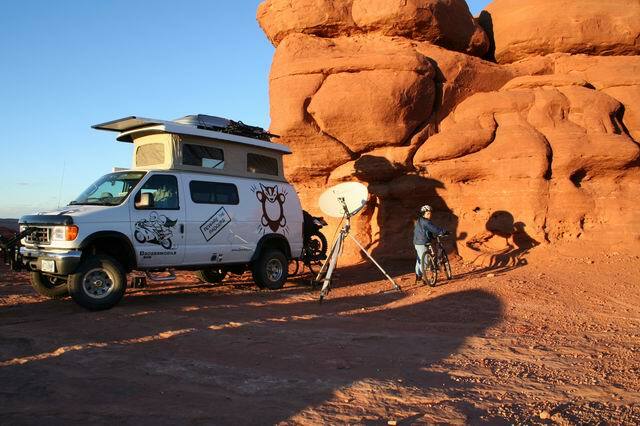 We called and looked at it that evening and then made an offer that night contingent on an inspection (as I saw some rust that concerned me, but it was dark and I didn't have the expertise to evaluate the situation or the state of the internal mechanical systems of the van). The results of the inspection caused us to withdraw our offer (the rust was the least of its issues, though it was somewhat extensive (over a year later we saw the same ad still running in the Seattle paper)). 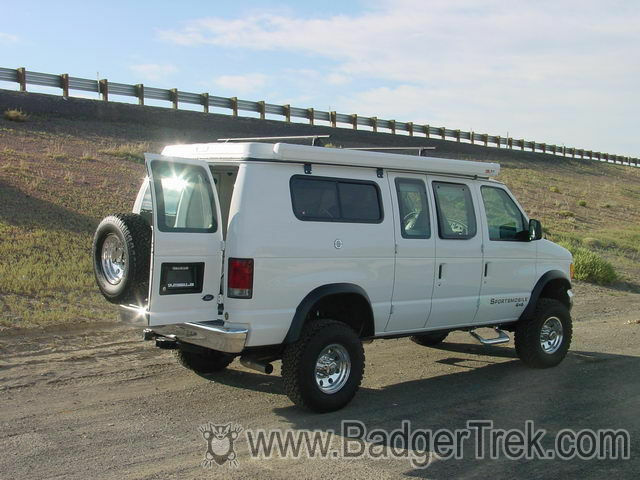 After that disappointment we decided that we should just order a new van so that it would be in the exact configuration that we wanted; in new shape so we did not have to rely on the prior owners having taken good care of it; and most important, available before we became old and senile. We begain the ordering process around the start of February 2005 on a white van chassis Sportsmobile West had in stock but unclaimed. With some schedule mix-ups, delays, and engine trouble before we even saw it, we ended up getting posession in June 2005. After picking up the van we have had a while now to get to know it, and to work on it. The folks at Sportsmobile West have been quite helpful and friendly, and offered some compensation for cosmetic damage that appears to have been done to the oil-pan and AC condenser fins during some engine work Ford did before we picked up the van. We have, however, become a bit disappointed with some of the quality of the RV conversion which is costing us a lot of time to re-work and would have cost Sportsmobile little to nothing to address during construction. The exterior work for the 4x4 conversion appears sound and reasonably well-thought out, but some of the interior stuff (e.g. plumbing, insulation) is sadly below what I would consider reasonable for the cost, and quite sloppy. For more details you can reference the sub-sections we are placing in the contents to the upper left of this page. (Please realize that we are living in this vehicle year-round, with no house to retreat to for the foreseeable future, so things that concern us may not be of concern to others). 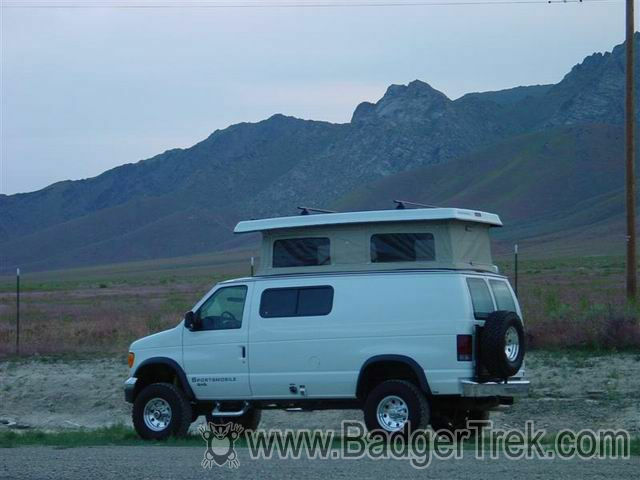 If we were to do this over, we would order the van, with 4x4, penthouse top, and windows, but none of the interior work, and do all of that ourselves. We have had to tear into most of the systems already, and this has used up any time-gains we had obtained by paying Sportsmobile to do the work. For any item they sell and install, the same item purchased seperately at retail seems to be available at about 1/2 the price. At 24500 miles so far we are averaging about 13mpg, which is a fair bit less than we had hoped for. I certainly don't drive with a lead-foot. It is difficult to keep track of the mileage as winter comes along and we use diesel for heat and cooking more often. The speedo and odometer are also off by about 10% relative to the GPS (speedo says 65, GPS says 71, road markers agree with GPS). Factors that contribute to our relatively low mileage that we have thought of: Fuel used for heating & cooking; We tend to pick hilly and rough areas to explore and drive through; We have a lot of stuff hanging off the van contributing to wind resistance; etc. Our best mileage per tank has been 16.5 in flat expanses of Nevada at about 60mph. Changing the tires from the 32.5" diameter ones that came from Sportsmobile to the 37" tires we are running now did not noticably affect the mileage, even without a gearing change at the differentials. The RPM at highway speed did drop, for a nice quieting in the cab. Currently we have no plans to re-gear as this puts the engine at about the RPM it would be with the stock Ford tires and 3.7:1 gearing. Taken the first night we stayed in our Sportsmobile. With new Aluminess bumpers & roof ladder. Photos taken in Southern CA. 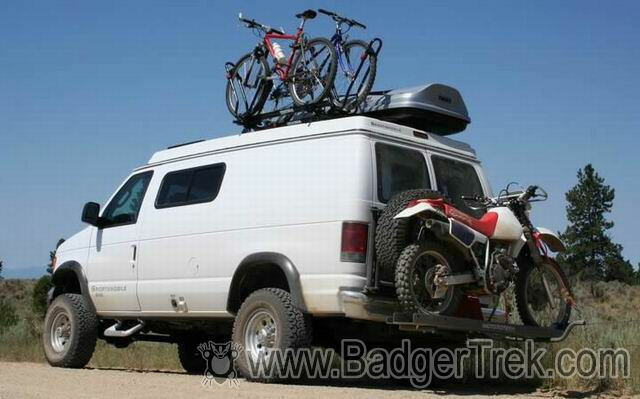 With hood and cheek vents, bike rack on rear bumper, new grill, tranmsission cooler, etc.